Where do your Red Tents meet: We meet in the Yoga Room in the colder months; October-April. And out in the meadow when it’s warm enough; from May-September. A monthly women’s circle, gathered round the fire , on the full moon. Creating sacred space, allowing time to connect, reflect, share, listen and be heard. working with the wheel of the year and earth cycles to connect with the sacred feminine. 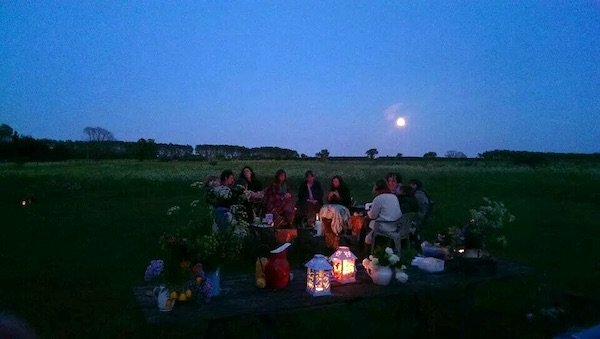 We gather around the fire at 6.30 every full moon, indoors in the colder months, or out in a beautiful wildflower meadow in the warmer months. After half an hour or so of greeting one another we begin by taking a few moments to sit in silence. We are then lead in a grounding meditation which reflects on the elements, the season, or the themes at work within each particular full moon. We then have time to share. We use a ‘talking bowl’ which , like a talking stick, means that whoever has the bowl is allowed to speak without interruption, to be really listened to. This forms the majority of our work within the group. If people wish to respond to something someone says, they can do so when it is their time with the bowl. We close with a short meditation of gratitude. And then have time for sharing food and drink by the fire. People can stay as long as they like after the closing meditation. Do you ask participants to bring anything, wear red or make a donation? : We ask that everyone brings a little wood for the fire , and something small and yummy to share. And a warm blanket to keep themselves cosy.